Plug Connection strives to deliver high quality plugs and liners on time, in great condition and in the most appropriate and economical shipping method possible. We have experience shipping very perishable product across North America. Our experienced team will work diligently to get that product to your door quickly and safely. Products are securely packaged in our custom shipping boxes and ship via UPS, FedEx, GSO, or air freight. Large orders on rolling racks or our custom, one-way pallet racks ship via GSO, common carrier, or Plug Connection truck. Freight damages must be reported within 48 hours. Claims information under Freight Damage & Freight Claims below. Plug Connection’s Master Phytosanitary Certificate eliminates all domestic phytosanitary fees with the exception of tomatoes, grafted tomatoes, grafted tomato and potatoes (Ketchup ‘n’ Fries) into Alaska, Montana, and Nevada—$80*. International phytosanitary fees are $125* into Canada and everywhere else in the world. *Subject to increases. Tuesday through Friday 7:30 a.m. to 3:30 p.m.
For shipping large orders, our custom-built to order, environmentally-friendly pallet rack reduces time receiving and unloading. 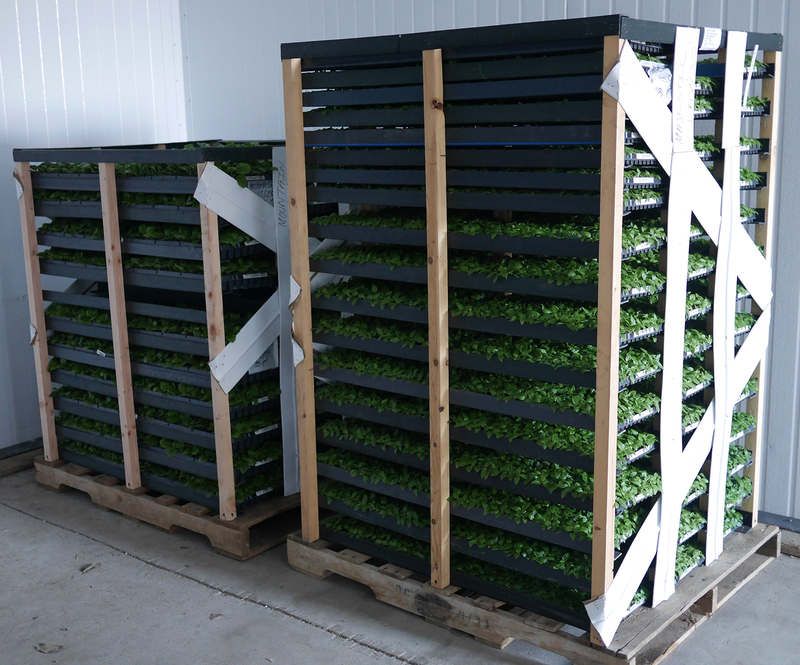 Our small 4’ pallet rack accommodates up to 60 trays, or as many as 162 trays per large 6’ pallet rack. 100% recycled plastic shelving—reuse or recycle. Shelves are braced to withstand the transit, yet are easy to breakdown or reuse upon receipt. Our UPS approved and time-tested boxing system has allowed us to ship across the country. 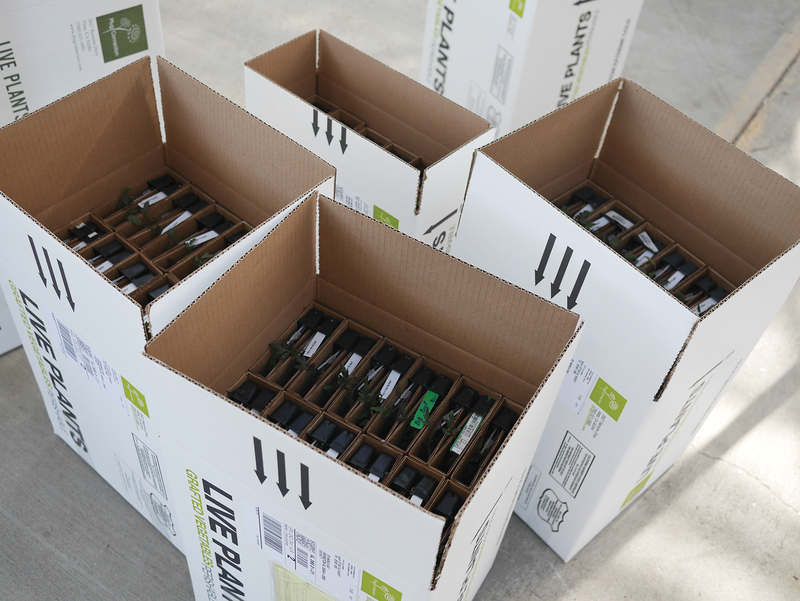 Most of our product ships in the side loading, durable box with 2-6 inserts to accommodate different sized plugs and liner trays. Appropriate sizing reduces freight damage and ensures grower-customer satisfaction. Special packaging and boxes securely protect the shipment of our grafted products. 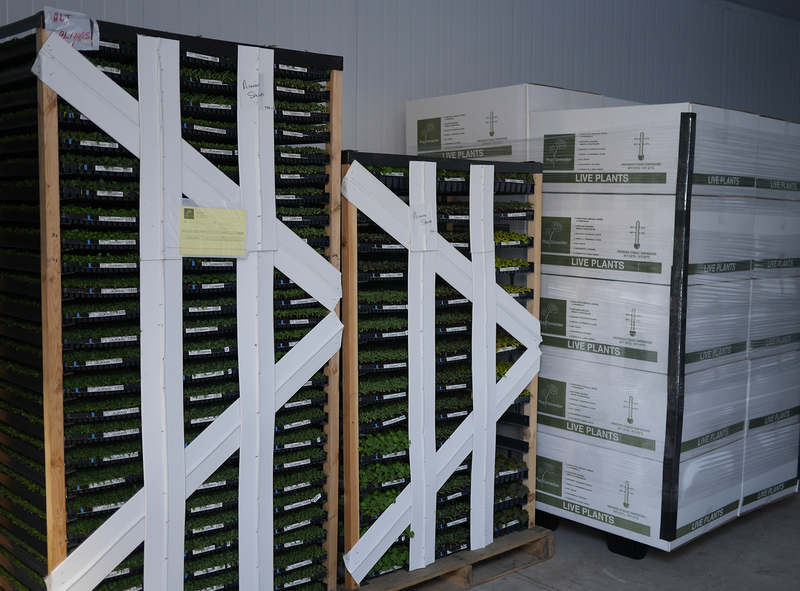 Free freight on Mighty ‘Mato and Mighty Veggies orders only applies to full boxes of 20mm varieties—2-tray box or 4-tray box. Additional charge for winterized box. * All boxes shipped to cold weather states from weeks 01 to 12 will be winterized. Cold weather states: AK, CO, CT, DE, IA, ID, IL, IN, KS, MA, MD, ME, MI, MN, MO, MT, ND, NE, NH, NJ, NM, NY, OH, OK, OR, PA, RI, SD, UT, VT, WA, WI, WV, WY *Plug Connection may stop shipment without approval or winterize box based on weather forecasts year round to any state. Partial box charge is $25.00 per box. Customers should inspect boxes and plants in the presence of a representative of the carrier. If damage exists, it should be noted on the bill of lading at time of signature. All shipping damage must be reported to claims@plugconnection.com within 48 hours with digital images. No freight claims will be honored on partial boxes. SHIPMENTS ARE NOT INSURED. 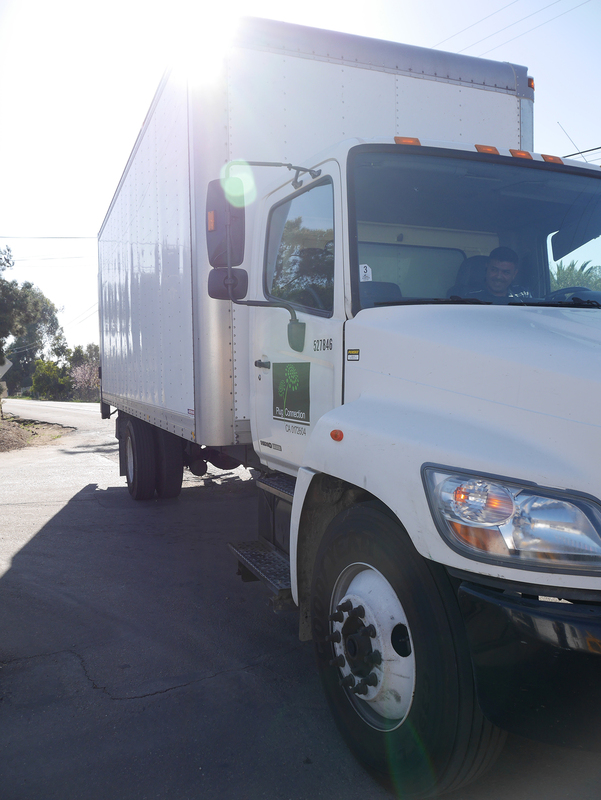 Our normal terms are based on shipping from Plug Connection in Vista, CA. Plug Connection will provide assistance in processing freight damage claims. However, Plug Connection will not assume liability for any shipment unless it was shipped on one of our trucks. Orders sent during inclement weather will be at the customer’s risk. Please contact us as early as possible if customer would like to delay shipment due to weather. Cold weather boxing is available, and our winterized box charge is $8.00 per box and mandatory at our discretion. See details under Box Charges above. ALL RATES ARE SUBJECT TO CHANGE WITHOUT NOTICE. STANDARD FUEL SURCHARGES INCLUDED. SUBJECT TO INCREASES WITH ABNORMAL SPIKES IN FUEL COSTS.